In 1787 four regiments were raised for service in India, one of them was the 76th, later to become the 2nd Battalion the Duke of Wellington’s Regiment. Like the 33rd it was given the relatively rare red facings to its uniform. 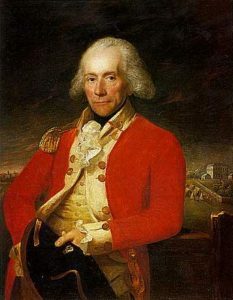 The first Colonel of the Regiment was General Sir Thomas Musgrave Bt. The Regiment arrived in India in 1788 and from 1790 – 1792 took part in the campaigns in Southern India which were to lead to the granting of the Battle Honour ‘Mysore’. The Regiment then moved north and in 1803 was in Cawnpore when war broke out against the Mahratta Chiefs in Hindoostan. The army was commanded by General Lord Lake and the only British infantry battalion in his force was the 76th. General Lake fought a brilliant campaign and obtained a series of outstanding victories, notably at Ally Guhr, Delhi, Leswaree and Deig, in each of which the 76th played a prominent part. The members of the regiment became so battle scarred that they became known as the ‘Immortals’. One of the Mahratta chiefs is quoted as saying of Lake’s army: “They came here in the morning, looked over the wall, walked over it, killed all the garrison and retired for breakfast” – However, it was not as easy as all that. The campaigning conditions were extremely tough. For instance before the battle of Leswaree the infantry marched 25 miles in eight hours in great heat. Then after only a one hour break they went into action. For the numbers engaged, that battle was one of the bloodiest in the history of British warfare in India. Lake had 824 casualties, a quarter of whom were in the 76th. The Mahrattas had 7,000. For the part the Regiment played in the capture of the fortress of Ally Ghur and the capture of Delhi it was awarded an honorary stand of Colours. At the end of the campaign, at the behest of the East India Company, the regiment was authorised to wear the word ‘Hindoostan’ on its Colours and appointments. At the same time the Commander-in-Chief, Lord Lake, obtained permission for the Regiment to use the badge of an ‘elephant’, a Houda was added later. ( Click Here to view the Regimental Colours). In 1797 the 33rd was sent to India where it took part in the Fourth Mysore War, which resulted in the defeat of Tipoo Sahib, ‘The Tiger of Mysore’, and the award of the Battle Honour Seringapatam. In 1810 two companies of the Regiment were detached to join a small force under Colonel Henry Keating which successfully captured the French held Isle de Bourbon. 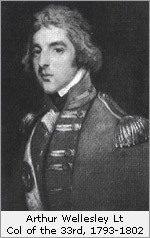 Colonel Keating later became a General and Colonel of the 33rd from 1845-1847. In the wake of the French Revolution war broke out between England and France on 1st February 1793. The British strategy was to use the Navy to cut off all French colonial possessions and to restrict activity in Europe to subsidising her allies. But this did not work for long and in 1794 the 33rd was part of a contingent sent to the Netherlands. Because of the unsatisfactory state of the army, due to peacetime neglect, and the appalling conditions and serious deficiencies of equipment; the force was soon in disastrous retreat. By 1795 the remains were back in England. For Arthur Wellesley who had assumed command of the 33rd two years earlier, it was a lesson in ‘how not to do it’. While the Regiment was in the Netherlands two of its companies were detached as part of a picked force to capture three French held islands in the West Indies. That campaign likewise ended in failure, as a result of appalling losses due to disease. The 76th returned from India in 1806. The following year it was ordered to the Peninsula where it disembarked at Corunna as part of a force of 11,000 men. They advanced into Spain where they joined up with the army of Sir John Moore. However, before long the force had to retreat under threat to its lines of communication from a French army under Napoleon. The retreat took place under dreadful weather conditions, over very bad country. Eventually Corunna was reached where a battle was fought which resulted in the death of Sir John Moore. The 76th was awarded the battle honour Corunna for its part in the campaign. Six months later, in June 1809, the 76th took part in the Walcheren Campaign. This expeditionary force, which was one of the largest ever sent from the shores of Britain up to that time, was also one of the worst managed. By December the 76th was back in England, much reduced in numbers, 23,000 men of the force had died of disease, Only 217 had been killed in action against the French. In 1813 the 76th returned to the Peninsula and took part in the closing stages of the war in Spain. In the process it acquired the battle honours Peninsula and Nive. The war ended in April, but there was no rest for the 76th which was forthwith ordered to Canada, arriving there in August 1814. The war against the United States had been in progress for two years and the cessation of the French war gave an opportunity to prosecute operations with greater vigour. The plan was to invade New York. The first objective was Plattsburg, where the Americans were nearly defeated. However, because of loss of command of Lake Champlain, which flanked the army’s route, the only option was to retire. Peace was signed at the end of the year and thus ended the 76th’s long period of active service. It was almost one hundred years before it again fought as a battalion. 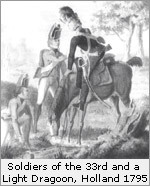 The 33rd Regiment returned from India in 1812. A year later it formed part of a force first sent to northern Germany and then, in 1814, to the Netherlands. It was decided to attack the near impregnable fortress of Bergen-op-Zoom as a preliminary to the capture of Antwerp. The attack failed. Later the same year peace was signed with France. The peace was short lived. Napoleon escaped from Elba and quickly gathered a new army about him. The Duke of Wellington had been placed in command of the allied forces in Belgium and there his old regiment, the 33rd, joined him as part of the 5th Brigade. In June 1815 Napoleon began his advance on Belgium where the allied forces were distributed along the frontier. On 16th June the French attacked them at Quatre Bras. 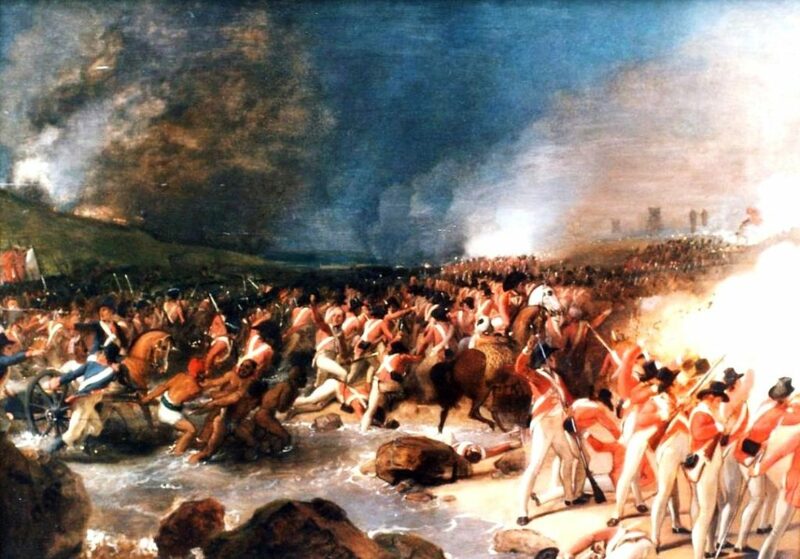 The 33rd was heavily involved and played its part in ensuring the safe withdrawal of the British force to Waterloo. There, on 18th June, was fought the battle which was forever to be associated with the name of Wellington. The battle lasted all day and despite repeated attacks the British squares held firm against the massed attacks of the French cavalry. Napoleon, frustrated, is reported to have said ‘These dogs of English never know when they are beaten’. Finally Wellington, aided by the Prussians under Blucher, drove the French from the field and the long periods of wars against them came to an end. 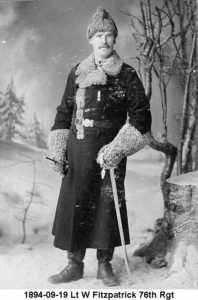 Due to the lack of medical knowledge at that time and the climatic conditions of the countries in which the army had to serve, peacetime service was often no less hazardous than war. Periods in the UK were usually relatively short in duration. Even when regiments were stationed in the UK, they rarely remained in one place for long. Thus the 33rd retured to the UK in 1816 and in the next four years was kept on the march between Hull, Sunderland, Nottingham and Portsmouth; from where half the Regiment went to Guernsey, Stirling, Glasgow, Ulster and finally Dublin. In 1821 it was sent to the West Indies where, like all other regiments, it suffered the ravages of yellow fever. From that and other causes, eleven officers and 560 NCOs and men died in the ten years the regiment was stationed there. Back in the United Kingdom in 1832 it only had time for a brief spell in Ireland before again being sent overseas, this time to Gibraltar, where it remained from 1836 until 1841. Next it was sent to the West Indies again, though this time for only three years. In that period six officers and 156 NCOs and men died from yellow fever and other causes. From 1844 the 33rd was in Nova Scotia, returning to the UK in 1848. When the Crimean War broke out in 1854 the regiment was in Ireland. 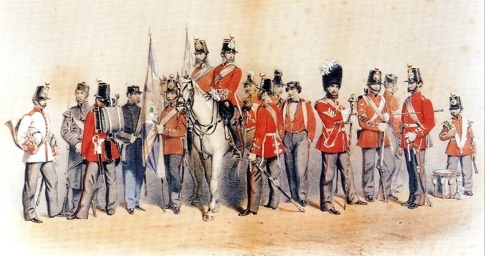 In 1815 the 76th was in Canada and remained there for the next twelve years before being sent to Ireland. In 1834 it was its turn for a tour in the West Indies where, like the 33rd, it suffered very many deaths from yellow fever. In 1839 alone there were 120 deaths from the disease. In the next thirteen years the 76th was constantly on the move being stationed successively in Nova Scotia, Ireland, England, Scotland, Corfu, Malta and finally, in 1854 back in Nova Scotia. It only spent nine out of forty years in the UK. One other aspect of both home and overseas service in this period was that more often than not regiments were dispersed into company or smaller detachments. For instance; in 1848 when the 33rd gathered at St. John, Nova Scotia for embarkation prior to return to the UK, it was the first time the regiment had been concentrated in one place in seven years of overseas’ service. In 1852 the Duke of Wellington died. The following year, on the 18th of June 1853, the first anniversary of the Battle of Waterloo following his death, the title of “ 33rd or (The Duke of Wellington’s) Regiment” was conferred on the 33rd Regiment, due to the Duke’s long and close personal connection with the Regiment. The new Regimental insignia incorporated the lion, from the Duke’s crest, and the mullet (5 pointed white star) which was placed upon the shoulder of the lion. The mullet remained on the crest of Arthur Wellesley to denote he was the third son of the Earl of Mornington, it was not removed until both his elder brothers passed away, at which time he became the Earl of Mornington. 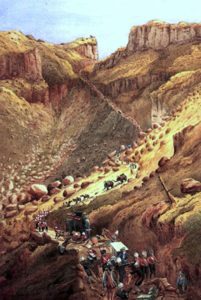 Between the conclusion of the Crimea War in 1856 and the end of the century the British Army was constantly engaged in various parts of the world, including India, Afghanistan, China, Abyssinia, West Africa, Egypt, Sudan, Burma and South Africa. More often than not these small wars started with a surprise attack by natives in overwhelming numbers, which usually led to the defeat or withdrawal of the British forces. In due course a field or expeditionary force would be assembled, followed soon afterwards by a crushing defeat of the enemy, the critical battle being of short and sharp duration. In May 1857 mutiny broke out in the Indian Army just when the 33rd had arrived in Mauritius from England. However, after only the briefest of stays it was sent to India. There the Regiment was constantly on the move on the east coast, to the north and south of Bombay, operating in small and sometimes isolated detachments. After the mutiny had been quelled a campaign medal was issued, but the 33rd, despite the arduous nature of its duties, did not qualify since in those days at least half of the regiment had to be engaged together to be eligible. For the same reason the Regiment did not qualify for a Battle Honour, though the other regiments of Sir Hugh Rose’s Central India Field Force, whose flanks the Regiment had protected, were awarded the honour of ‘Central India’. The 33rd remained in India until 1867. In that year a punative expeditionary force was formed to rescue two British Government representatives and several European missionaries who had been imprisoned by King Theodore, the half insane ruler of Abyssinia (now Ethiopia), in an attempt to procure modern weapons and artillery. 12,000 British and Indian troops had to be moved the 380 miles from the Red Sea coast to Magdala, King Theodore’s capital. The task was achieved with great efficiency and on 13th April 1868 Magdala was stormed and King Theodore shot himself, with a pistol previously presented to him by Queen Victoria. The 33rd led the attack and in the process received two VC’s. The Regiment was also granted the Battle Honour ‘Abyssinia’ and awarded a campaign medal. Magdala was the last occasion the 33rd carried Colours into action. It has been described as one of the most expensive and remarkable expeditions in the 19th century. On the 1st of April, 1873, as part of the Cardwell reforms, the Depot of the Regiment was established, with the construction of a new barracks, in Halifax, West Yorkshire. The Barracks construction was completed in 1877 and on the 1st of September the Depot Companies of the 33rd and 76th Regiments marched in. From 1868 onwards a number of far reaching changes were made to the organisation and administration of the army. For infantry regiments the most important was the decision, under General Order 41/1881, issued on 1st May 1881, amended by General Order 70/1881 dated 1st July, during the Childers reforms (continuation of the Cardwell reforms) to link all regular regiments together in pairs, plus two Militia Regiments. This brought about the creation of the 2nd Battalion of The Duke of Wellington’s Regiment as the 76th Regiment was merged into the regiment, in May 1881, initially as The Halifax Regiment (Duke of Wellington’s). The title was changed to The Duke of Wellington’s (West Riding Regiment) on 30th June 1881, in a revised appendix to General order 41. In addition the two battalions of the 6th West Yorkshire Militia became the 3rd and 4th Battalions. At the same time the three West Riding Volunteer battalions became linked with the Regiment. In June 1896 the natives of Mashonaland rebelled and, operating over a large area, killed more than 120 white settlers. A small field force was quickly assembled comprising little over 500 men, of which 150 came from the 2nd Battalion, then stationed in Natal. In one battle the force inflicted over 200 casualties for the loss of three killed and four wounded – a typical example of the retribution inflicted in small wars. By November 1896 the campaign was all over. However, the next war in Southern Africa was to be of a very different nature.